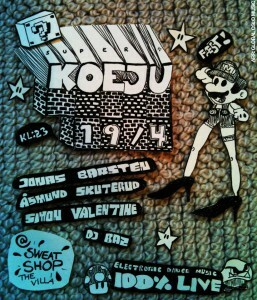 KOÈJU LIVE ELECTRONICS: A club concept dedicated to live dance music. Host band, guest artists, new expressions, live beats, electronic & acoustic music for the dancefloor. Beyond the world of playback loops and pre-recordings comes a dazzlingly original sensation in clubbing. 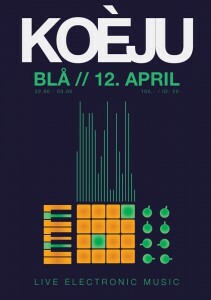 We present Koèju, a group of innovative digital musicians pioneering a new frontier of live, improvised, real-time mix-it-up electronica. Come and join us (at Blå) for a cutting edge night of crazy aural magic and live-made beats bursting with the high-octane joy of genre-mixing, improvisation, free flow - and whatever else the moment asks. Come and hear the future of hand crafted electronica. Come, dance where we are!